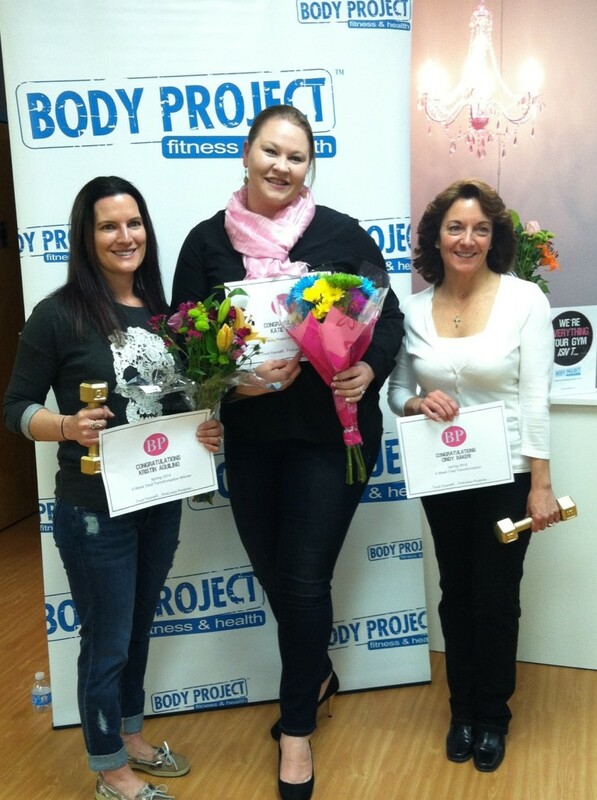 Kristin Aquilino (left), Cindy Baker (right) and our 2014 Inspiration Award winner Katie Zurich (center)! Grande Finale Happy Hour on April 11th! Since 2010, we’ve held our signature 6-Week Transformation every Spring and Fall and my team and I somehow think it will get easier to select the women who deserve the title of Transformation Winner and the coveted “Golden Dumbbell” award (not to mention a free year of our Premium membership! )…but we’re ALWAYS proven wrong. This past 6-Week Transformation was no different! Hundreds of women have gone through our 6-Week Transformation over the last 4 years…and while the journey for each woman may be different, the ultimate goal is the same…uncover the absolute strongest and best version of herself – in body, mind and spirit. We’re thrilled to announce our 2014 Spring 6-Week Transformation winners who show us how to live inspired, unleash our inner strength and transform in body, mind and soul! Transformation winner Cindy Baker: Cindy’s transformation story started over 4 years ago when she was one of Body Project’s very first members. Cindy has transformed her body, her mindset and has achieved so much including completing her first triathlon last fall! Cindy is a model of determination and perseverance…and we should all be inspired to be as dedicated to ourselves, our families and our community as Cindy is…more on Cindy’s transformation story to come! Transformation winner Kristin Aquilino: Kristin’s transformation was far beyond her physical strength and stamina…Kristin’s transformation has not only had an impact on her own life, but has extended to her husband and three young children. Kristin embodies what it means to be a strong professional woman, an inspiring mother, and a loyal friend…I know you’ll be as inspired by Kristin as we have been when you hear more about her story in the coming weeks! 2014 Inspiration Award Winner Katie Zurich: Last year we awarded our first “Inspiration Award” to a woman nominated by the Body Project community for being inspiring and motivating (Beth Robbins!). This annual award is special because the winner is nominated and chosen by her peers who find inspiration through her to continue on their own journey. Katie Zurich brings a special spirit and energy to Body Project…inspiring women (and probably not even realizing it!) with her wit, charm, fabulous smile and an occasional British literature quote (she’s a Brit Lit professor!). Katie is just one of those women everyone loves to be around…and that’s why she is our 2014 Inspiration Award winner! Congrats to each of our winners, and to each and every woman of the BP family who continues to commit to unleashing the ABSOLUTE BEST version of herself! Stay tuned for more on these inspiring stories in the coming weeks! P.S. If you’re ready to take on your own transformation…come see what we’re all about and take advantage of our 7 days of unlimited sessions for $17. We’ll design your personal 7-day program to maximize your results and see if Body Project is the answer you’re looking for to achieve the physical and lifestyle results you know you are capable of, but just need the expertise to help you get there.